Listed below are some of the Buses that have at one time or another been seen at Chelsham Garage and that I feel are worthy of a special mention. 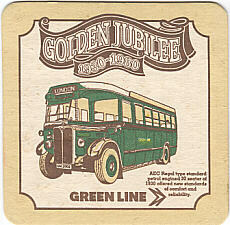 Appeared on London Country Green Line Posters and Beer Mats to celebrate the Green Line Golden Jubilee in 1983. Please see the picture of the beer mat at the bottom of this list. Survived being blown over on the forecourt of Chelsham Garage during the strong winds of January 1990 and worked the final Route 196 journey on 27th April 1990 and was the very last bus to work in public service at Chelsham Garage. Number 1 of the type, seen at Chelsham on Private Hire.